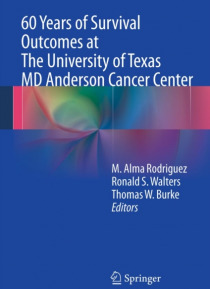 This unique book provides a retrospective analysis of the changes in survival outcomes at the University of Texas, M.D. Anderson Cancer Center over the past six decades. Since opening its doors in 1944, M.D. Anderson has kept a continuous, uninterrupted data repository of the treatment and outcomes of each of its patients. It is this visionary database from the center's tumor registry which makes … this groundbreaking book possible. Tracking results across time, this book shows radical shifts in outcomes trends, where great progress has been made, and where there is still a long way to go, and offers a snapshot into the parallel history of developments in care. Such data is crucial to informing how patients are counseled, how treatment decisions are determined, and how prognoses are made.60 Years of Survival Outcomes at the University of Texas, M.D. Anderson Cancer Center is the only book to concurrently present longitudinal data on survival outcomes across the spectrum of rare and common cancers. Each chapter deals with a specific disease site, discussing current management approaches and presenting key data replete with illustrative charts, graphs, and tables. With the resources available only to the practitioners at this inimitable institution, this book heralds a cornerstone moment in the study of survival outcomes and the depth of our knowledge of cancer care.